Bobcat Boardwalk | Florida Hikes! The Bobcat Boardwalk at Shark Valley is a popular destination in winter and spring to see migratory and nesting birds. Most visitors opt to bike or take the tram around the 14-mile paved loop through the River of Grass, which provides a stop at a tall observation tower along the route. For folks who walk a portion of the paved loop, the Bobcat Boardwalk is always a part of their explorations. 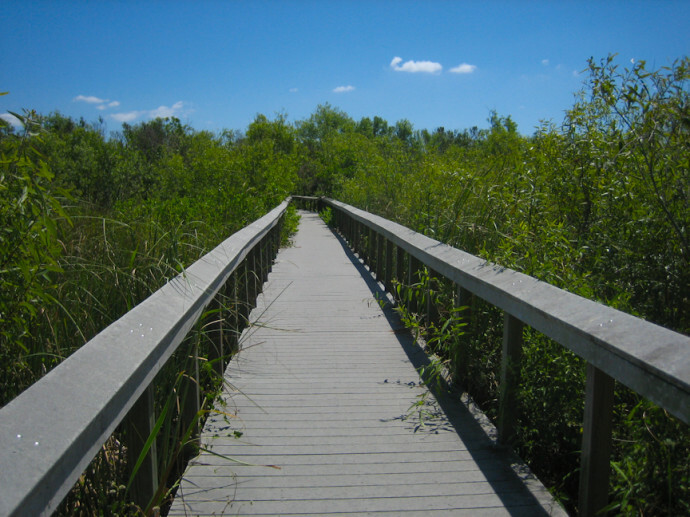 The boardwalk allows you to observe a sprawling saw grass prairie and tropical hardwood hammock. Fees/Permits: Entrance fee of $25 vehicle, $20 motorcycle, $8 cyclist/pedestrian. Good for one week. The parking area is open 8:30-6. Follow the paved loop south to the start of the trail. Return back the same way you came, or use the paved loop to return to the parking area. From the junction of SR 997 (Krome Ave) and US 41 west of Miami, drive 18 miles to the Miccosukee Reservation; the park entrance is on the south side of the highway. Walk behind the Visitor Center and follow the paved trail paralleling the canal. In a few moments you come to the Bobcat Boardwalk trailhead on the left. Turn left and follow the boardwalk into a bayhead swamp. It continues across an open sawgrass prairie with nice views. Purple pickerelweed blooms rise out of water-filled solution holes in the prairie. The boardwalk meanders into a stand of willows. A bench lets you rest above a flowing stream. Entering the tropical hardwood hammock, you can see that the trees have been battered but are still recognizable—cocoplum with its round leaves, white stopper with its skunky smell. Under a canopy, a set of benches provides a shady stop. The boardwalk makes a sharp left and crosses more open prairie onto another tropical hammock island thick with fallen trees. You emerge at the paved loop at an interpretive sign explaining periphyton, the goopy-looking greenish brown blobs that float everywhere and are the primary biomass of the Everglades. Exit from the boardwalk and turn left to follow the paved loop back around to the visitor center.